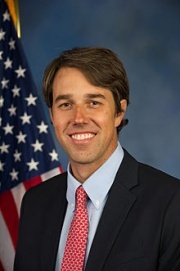 Beto O'Rourke, entered Congress with the 2012 elections, as a Texas Democrat, representing District 16. O'Rourke defeated incumbent Silvestre Reyes in the Democratic Primary in May 2012. When he is not in Texas, Beto O'Rourke lives a five-minute walk from his Capitol Hill office, in a row house he shares with two Democratic colleagues, Jared Huffman and Salud Carbajal, both from California. Huffman is the landlord. Beto O'Rourke, whose father was a county judge who once ran for El Paso’s congressional seat, showed little interest in politics until he turned 30. After graduating from Columbia University in New York, where he majored in English, he moved into a converted Williamsburg factory with a few musicians and toyed with becoming a writer. In 2005, O’Rourke and two friends decided to run for City Council against three candidates backed by the city’s Democratic machine, and they won. Reyes was the former chair of the Congressional Hispanic Caucus and had helmed the Intelligence Committee, and he had the support of Bill Clinton and President Barack Obama. He referred to his opponent dismissively as “Robert” and dragged him with an ad implying he wanted to give drugs to kids and another that used footage of O’Rourke falling on the floor at a bar as a City Council member, allegedly “intoxicated.” (O’Rourke said he fell while dancing.) But O’Rourke had caught Reyes napping. He knocked on 16,000 doors and avoided a runoff by 216 votes. Beto O'Rourke inherited his El Paso political connections from his father, Pat O'Rourke, who died in a bicycling accident in 2001. The elder Mr. O’Rourke won elections as a county commissioner and county judge as a Democrat, and was the Texas state chairman for Jesse Jackson’s 1984 and 1988 presidential campaigns. Like many Texas Democrats of his generation, Pat O’Rourke switched parties in the 1990s. He ran as a Republican for Congress in 1992 and county judge in 1998, losing both contests. When Beto O'Rourke moved home to El Paso after graduating from Columbia University, touring with a punk rock band and working briefly in New York City, he launched a web development company and a short-lived local newspaper. Initial investments for the newspaper, called Stanton Street after his downtown El Paso address, came in increments between $2,000 and $10,000 from Pat O'Rourke’s friends, according to Lisa Degliantoni, whom Beto O'Rourke recruited from New York to help start the business. Mr. O’Rourke’s father died four months before the newspaper’s first print run. The first major client for the web development firm was El Paso’s Hunt Companies, owned by local construction magnate Woody Hunt. Mr. Hunt, whose firm is among the nation’s largest developers of military housing, was friendly with Pat O'Rourke since both men were El Paso teenagers. Mr. Hunt became one of Beto O'Rourke’s most reliable business and political benefactors. Since Mr. O’Rourke first campaign for Congress, Mr. Hunt has donated $4.2 million to Republican candidates for federal office and committees and $141,000 to Democrats. In Texas he has given $3.3 million to Republicans seeking state office and $143,000 to Democrats—nearly all of which went to candidates from El Paso. Mr. Hunt gave the maximum contribution to both of Mr. O’Rourke’s re-election campaigns. Along the way Mr. O’Rourke often reflected Mr. Hunt’s priorities. In El Paso he championed an array of Mr. Hunt’s projects—including a proposed 168-acre downtown El Paso development that would have seized property through eminent domain, which failed, and the successful public financing of a baseball stadium for the minor league El Paso Chihuahuas, which are owned by Mr. Hunt, his son Josh Hunt and two other investors. “Beto helped pass legislation at the city council that allowed Woody Hunt to do what he needed to do,” said Martin Parades, who has written an El Paso news blog since 2000. Mr. Hunt said in an interview that he has never asked Mr. O’Rourke for political favors and that he wasn’t involved in steering his firm’s IT contracts to Mr. O’Rourke’s web development company. In this season of political darkness across our country, our individual lights are coming on. We have great democratic leaders running for office! Just look at Rep. Beto O'Rourke from Texas who is running for the U.S. Senate. His father, [Pat O'Rourke], was one of the Rainbow’s 1988 presidential campaign managers. We #believeORourke and need Texas to do the same!! -Too much at stake in this election. VOTE! In June 2013 Progressive Democrats of America assigned activists to deliver their material to almost every US Congressman and several Senators. Julie Garcia was assigned as contact for Rep. O'Rourke. Our communities, our state, our country are infinitely better because of Dreamers. Thank you for a great summit in Austin. — with Laura Alejandra Sanchez, Dalila Reynoso-Gonzalez, Emily Pinal, Belen Iniguez and Jessica Espinosa. U.S. Rep. Beto O'Rourke, D-El Paso, addressed a rally in El Paso Texas marching "on the tent city where children separated from their parents at the border are being held at Tornillo Land Point of Entry, on June 17, 2018." "TORNILLO — World Cup soccer and backyard barbecues were set aside Father's Day morning for hundreds of people who chose instead to descend on this small West Texas outpost that's become famous the last 72 hours for being home to an immigration detention center for children. "Lawmakers, political candidates and members of the faith-based community joined people from across the country here to express their outrage toward the Trump administration's practice of separating immigrant children from parents who are seeking asylum. ""We decided there wouldn't be a more powerful way to spend Father's Day than with children who have just been taken from their fathers, children who have been taken from their mothers, children who won't be able to be with their family," said U.S. Rep. Beto O'Rourke, D-El Paso, who spearheaded Sunday's protest with former El Paso County Judge Veronica Escobar, the Democratic nominee to succeed O'Rourke in Congress. Others attending the demonstration included Lupe Valdez, the Democratic nominee for governor; Democratic state Reps. Mary Gonzalez of Clint and Cesar Blanco and Lina Ortega of El Paso; and Gina Ortiz-Jones, the Democrat challenging U.S. Rep. Will Hurd, R-Helotes; and Julie Oliver, the Democrat running to unseat Republican U.S. Rep. Roger Williams. "On Thursday, the Trump administration confirmed that Tornillo would house a detention center for immigrant children separated from their parents under the Trump administration's "zero tolerance" policy. On Friday, that facility was up and running. O'Rourke said he was told Sunday morning that there are 200 minors in the center, 20 percent of whom were separated from their parents. He said the remainder of the children arrived to the border unaccompanied. But O'Rourke said that once the children are separated, they are labeled "unaccompanied" and processed that way so it's unclear how many of them actually arrived alone. "The lawmakers and protesters gathered along the small road that leads to the facility and led a short march to the port entrance. "Marchers head towards the tent city at Tornillo Land Point of Entry to protest the tent city erected there to house children separated from their parents at the border. Critics have repeatedly mentioned the West Texas heat and questioned why the administration would house children in an area where triple digit temperatures are common throughout the summer. González said she toured the facility and said the conditions inside are humane. ""First and foremost, no kid should be in a tent or in any facility, but I think when we think of the tent city we think of Arizona, Joe Arpaio style," she said, referring to the former Maricopa County sheriff who used an outdoor facility for years. "That's not the situation here. There is air conditioning, there are doctors, there are caseworkers." "But she said the administration is barring news outlets and even lawmakers from viewing the facilities to keep attention on the facilities and away from a legislative solution to the country's immigration problem. ""We're not being told about the situation is like inside so we get caught up in tents, and not on policy," she said. "While most Texas Republicans were not going out of their way to wade into the situation, one exception was Hurd, who represents a sprawling district that covers most of the Mexican border in Texas, including Tornillo. Hurd, regularly ranked as the most vulnerable Republican in the Texas delegation, visited the tent city Saturday and came back decrying it as an unacceptable way to combat illegal immigration. "Furthermore, Hurd rejected the argument that anyone but the Trump administration was responsible for the policy. ""This is clearly something that the administration could change," Hurd told CNN after the trip to Tornillo. "They don’t need legislation to change it. They don’t need Democrats in order to change it. This is a Department of Justice policy, and this is something that’s being enacted by" the U.S. Department of Health and Human Services. "At the Republican Party of Convention Saturday, U.S. Sen. Ted Cruz — who O'Rourke is challenging — lay the blame for the current situation on Democrats in Congress, not the Trump administration. ""Nobody wants to see a child separated from him or his parents," Cruz told reporters Saturday, proposing that Congress "devote substantially more resources to providing immigration judges so that if a family crosses illegally and if they have a credible claim of asylum, that claim should be processed and processed quickly, ideally immediately, so that if it is a valid claim, they get asylum granted and if it's not a valid claim that they are returned to their home country promptly and expeditiously. ""That would be a far more just outcome in terms of laws," Cruz added. "The reasons we don't see that right now is Democrats are filibustering those kinds of common-sense solutions that could protect kids." "Land Commissioner George P. Bush, asked about the policy Friday, also pointed the finger at Congress. ""To me it's reflective of the failures of Washington, D.C., politics," Bush told reporters. "We need solutions, and that's not only short-term Band-Aid fixes ... but it's also developing opportunities for folks along the border." "Asked whether children and parents should be kept together, Bush replied that he did not "want to dive into specifics," but he raised a similar point that Cruz did, acknowledging difficulties in "triaging" various types of asylum cases. "Escobar said that the El Paso-based Border Network for Human Rights has scheduled another protest for Tuesday, and that lawmakers and activists have vowed not to let up until the administration rethinks its current policies. ""I feel like the rest of the country needs to be as angry as we are on the border," she said. If the administration continues to separate families, she added, then the president will use the policy as leverage to beef up border security and build his long-promised wall. "Patrick Svitek contributed to this report." October 6, 2017-Justin Snider, Democratic Candidate for US House of Representatives, Texas-District 06, received an official 2018 Endorsement from Freethought Equality Fund (FEF) PAC in Washington, D.C. Freethought Equality Fund is committed to support candidates who share the belief in the separation of church and state and in defending civil liberties of all Americans. In previous election cycles, Freethought Equality Fund has backed US Congressman Beto O'Rourke, TX-D16 (2014) and Andrew Zwicker (2017) member of the New Jersey General Assembly. Beto O'Rourke January 27, 2018. Appreciate Luke from Environment Texas coming out to the climate forum to present their Environmental Champion Award. It's an honor to be with so many bold advocates in Houston. Our communities, our state, our country are infinitely better because of Dreamers. Thank you for a great summit in Austin. — with Laura Alejandra Sanchez, Jarren Dalila Reynoso-Gonzalez, Emily Pinal, Belen Iniguez and Jessica Espinosa. In May 2018 Beto O'Rourke visited the Texas Organizing Project. Stephanie Corte, went to the University of Texas-Pan American in Edinburg, moved to Washington, D.C., to work on Sanders’ Senate finance committee staff and then returned to the Valley this year to serve as O’Rourke’s South Texas field organizer. The Alliance for Retired Americans Political Action Fund endorsed Beto O'Rourke in 2014. 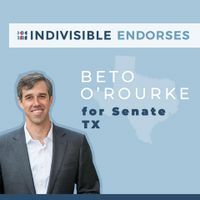 In 2018 Indivisible endorsed Beto O'Rourke. Brazos Valley Democratic Socialists of America tweeted from Beto O'Rourke event in January 2018. Democratic Socialists of America member Monica Olvera with Beto O'Rourke, May 1 2017. Debra Ann Borgen, Beto O'Rourke, 2017. Beto O'Rourke and Kolby Duhon. Beto O'Rourke signed Fossil-Fuel-Free pledge at the JOLT Town Hall forum. # JOLT The Vote. — with Beto O'Rourke . With Joey Gidseg, Judy Holloway, Mary Ward and Beto O'Rourke. In 2018 Zack Malitz was Beto O'Rourke's Field Director · Austin, Texas. Edward Z. Perkins works at Beto for Texas. Dominic Eduardo Chacon is a Field Organizer at Beto O'Rourke for Texas Senate, in El Paso. Andrea Reyes is a Field Manager at Beto for Texas, El Paso. Gabi Harris of Beto Texas, with Beto O'Rourke. Austin Democratic Socialists of America member David Hamilton wrote on Facebook November 30 2017 that DSA has "some standing" with reps Lloyd Doggett and Beto O'Rourke. National Nurses United 2018 endorsements included Beto O'Rourke for Governor. This page was last modified on 16 March 2019, at 12:37.